The Daylight Table Top Magnifying Lamp is ideal for needlework, jewelry-making or any other craft calling for close attention to fine detail. Provides both full spectrum daylight and 1.7x magnification, each on individual flexible arms, letting you come away from hours of work without the eyestrain produced by regular lamps. The Daylight Table Top Lamp is a unique combination of full spectrum light and 1.7x magnification. 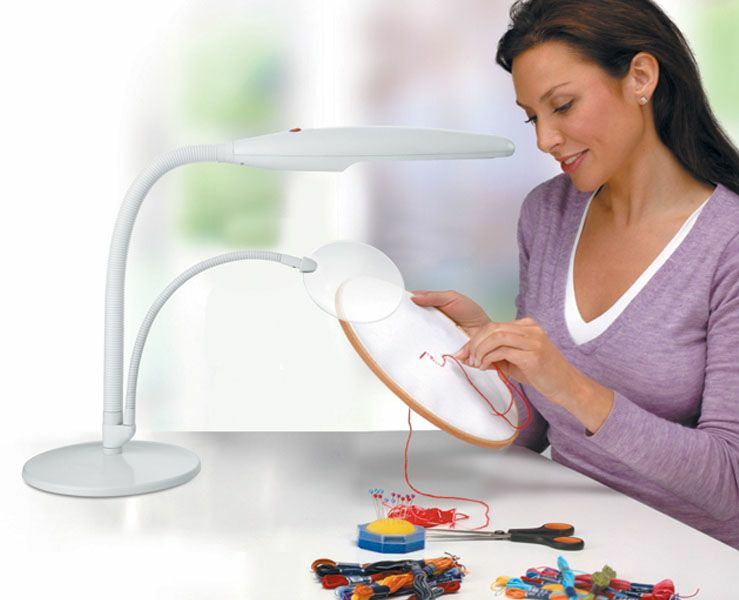 With an 18 watt (100 watt equivalent) lighting tube and a high quality acrylic magnifying lens each mounted on its own flexible long-reach arm, the lamp is suited for use on a table or any other level surface and provides the ideal atmosphere for reading, needlework, or any other activity that demands attention to detail. The innovative Easy Twist Shade, mounted on a 320 degree head joint allows for virtually circular rotation so the light can be concentrated precisely where it is needed. The lamp, fitted with an 18 watt energy-efficient daylight simulation tube-bulb, produces full spectrum lighting that allows for hours of work without the headaches, eye strain and fatigue produced by ordinary light sources. and has been approved by the British Royal National Institute for the Blind as appropriate for those with low vision or wearing corrective lenses. With none of harsh glare or strobe-like flickering of a fluorescent tube, the patented daylight tube bulb produces a soft light that permits true color perception but is also saving energy. Its 18 watt low heat daylight simulation tube puts out the equivalent of a 100 watt tungsten filament bulb yet uses 75 to 80% less energy. And since the reduction of energy consumption also reduces greenhouse gas emissions, the lamp does its bit in protecting your vision and the environment!